You all can breathe again! Mark Graban's Lean Hospitals, 3rd Edition is now available. The fact that there is a 3rd edition speaks volumes about the quality information found in this book and the respect it has garnered within the field of Lean Health care. The picture to the left shows my copy of the first edition of Lean Hospitals. As you can tell, it has been well read and shared with many interested staff and colleagues. I also have the 2nd edition, but it is a Kindle ebook and, therefore, impossible for me to show how much I have referenced it, also. My copy of the 3rd edition has been ordered. I'm going back to the actual book format (although it is also available from Kindle). I like being able to "dog ear" page corners, write notes in the margins and stick different colored Post-em notes to the pages to remind me of the great ideas and insights I get every time I read Lean Hospitals. 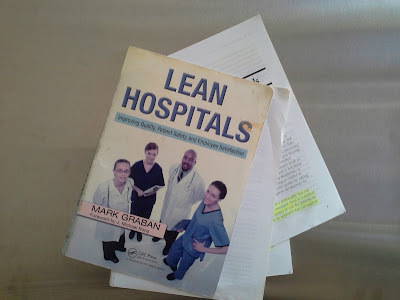 If you only get one book to read about Lean in general, and Lean Healthcare specifically, Mark Graban's Lean Hospital, 3rd Ed. is, by far, the book to get. Order your copy here!